With the construction of an increasing number of roads to fulfil rising transportation needs, roadside habitats have also expanded throughout the world. Most roadsides are managed to some extent, mainly for traffic-safety purposes. However, with appropriate maintenance, many roadsides can also benefit biodiversity by harbouring a rich flora and fauna. Roadsides offer opportunities particularly for grassland species [1, 2] and have therefore been acknowledged as potential substitutes for grasslands and similar open habitats , which are currently declining globally [4, 5]. More specifically, the management regimes and abiotic conditions of roadsides may be similar to those of mown or grazed semi-natural grasslands . Semi-natural grasslands are known for their high biodiversity [7, 8] but their extent has declined rapidly in Europe over the last century due to agricultural intensification and abandonment of traditional management [9, 10]. Many species that historically were associated with the traditional low-intensity management of meadows and pastures now thrive along roads instead . In Sweden, some 190,000 ha of managed grasslands occur along built infrastructure, 164,000 ha of which constitute roadsides . This amounts to more than a third of the total extent of meadows and pastures in Sweden (ca. 450,000 ha) . It is therefore crucial to optimise roadside management in order to sustain biodiversity values linked to semi-natural grassland habitats. Managing grassland habitats for biodiversity usually requires removing vegetation, e.g. by mowing, grazing or burning, thereby slowing or halting succession to more woody communities . Differences in mowing regimes may affect both animal and plant populations. For instance, mowing before flowering and seed production will weaken the link between pollinators and flowering plants, as many plants need assistance by pollinators to produce seeds and pollinators need the flowers for nectar and pollen resources . Disturbance-tolerant plant species will generally be favoured by mowing, while species representing late-successional stages will be disfavoured. Current recommendations for roadside management to promote conservation values are largely based on botanical research on meadows, pastures and other semi-natural grasslands , where the effects of grazing and mowing on biodiversity are well studied . However, due to construction and management activities specific to roadsides, the impact of mowing and grazing on roadside biodiversity could potentially be different compared to effects documented from grassland management. Soil preparation, ditching, use of salt for de-icing and other measures for infrastructure construction and maintenance could modify the effects of roadside management. In addition, roadsides receive a continuous influx of nutrients and base cations via run-off from the road surface. The higher temperature on the road surface further contributes to the specific environment of roadsides, making them not directly comparable with other grassland habitats. Management effects on biodiversity are less well studied along roadsides than in meadows and pastures, and much of the existing evidence on roadsides is comprised of grey literature not assessed by independent reviewers. For these reasons, key stakeholders in Sweden have emphasised the need for more targeted guidelines for roadside management based on actual studies of roadsides . Following a suggestion from the Swedish Board of Agriculture, we recently performed systematic mapping of the available knowledge on how roadside management affects biodiversity and the dispersal of species . Since we wanted to look for evidence on general patterns of management effects, we made a global survey with no particular focus on Scandinavian conditions. The systematic map showed that much of the literature on ecological effects of roadside management describes attempts to revegetate recently constructed roadsides, or the use of herbicides for controlling roadside vegetation in general and invasive/nuisance plants in particular. Chemical management of roadsides is nowadays largely restricted in many countries, and the literature that we found on such management was dominated by older American studies (many of them dating from the 1970s or earlier) on substances that are now obsolete. However, we also found more than a hundred studies with more obvious relevance to biodiversity conservation or restoration in roadsides, including their role as substitutes for grasslands and other habitats under threat in intensively managed landscapes. More specifically, we identified 97 studies of how the richness, diversity or abundance of various taxonomic or functional species groups in roadsides is affected by vegetation management such as regular mowing, burning, grazing or selective mechanical removal of plants. These disturbance-based management practices can be regarded as comparable, as all of them entail partial or total removal of biomass . A review of their impact on biodiversity could therefore permit some generalisable conclusions. Most of the 97 studies recorded management effects on vascular plants, but there were also 14 potentially relevant investigations of insects or other invertebrates. Studies of non-chemical interventions that might aid the conservation or restoration of roadside biodiversity should be of considerable interest to roadside managers, including transportation and conservation agencies, park authorities, municipalities, farmers and other landowners. This has been confirmed by our contacts with Swedish stakeholders. For instance, according to a representative of the Swedish Transport Administration, it is of central importance to clarify precisely how mowing and similar kinds of roadside management should be carried out to give the desired results under various biotic and abiotic circumstances. Effects of different management interventions and the frequency with which they are performed were mentioned as being of particular interest (Anders Sjölund, pers. comm.). A representative of the Swedish Biodiversity Centre also underscored the importance of considering potential effect modifiers such as soil type, nutrient status, shading, management history and presence/absence of invasive species (Tommy Lennartsson, pers. comm.). Encouraged by the input from stakeholders, we decided to proceed with a full systematic review of how disturbance-based maintenance or restoration of roadsides affects the diversity of vascular plants and invertebrates. Systematic reviews are designed to permit unbiased quantitative conclusions. Our review follows the guidelines for systematic reviews in environmental management issued by the Collaboration for Environmental Evidence [20, 21]. The design of the review was established in detail in a peer-reviewed protocol . The primary aim of the systematic review was to clarify how the diversity of vascular plants and invertebrates is affected by roadside maintenance or restoration using various forms of non-chemical vegetation removal. The ultimate aim of the review was to facilitate evidence-based management of roadsides to conserve or restore the diversity of plants and invertebrates. The review is largely based on studies selected from our systematic map of the evidence on how roadside management affects biodiversity and the dispersal of species . We applied no geographical restrictions when collecting and analysing the evidence. How does roadside maintenance and restoration implementing non-chemical vegetation removal affect the diversity of vascular plants and invertebrates? roadside habitats and the species of vascular plants and invertebrates found within them. maintenance or restoration of roadside habitats based on non-chemical vegetation removal such as mowing, grazing, burning, clearance of shrubs and saplings, coppicing, pruning, or mechanical removal of invasive plants. non-intervention or alternative forms of the interventions. measures of functional/taxonomic diversity (including abundance) of vascular plants or invertebrates. Most of the evidence synthesised in this systematic review was selected from the recently compiled systematic map of biodiversity impacts of roadside management . The systematic map was based on literature searches using 13 publication databases, four search engines and 36 specialist websites. The majority of these searches were performed in October–December 2015. English was the primary search language, but searches on specialist websites for relevant literature in Danish, Dutch, French, German, Norwegian, Spanish or Swedish were made using search terms in these languages. We checked the comprehensiveness of our searches using the bibliographies of five literature reviews (see Bernes et al. for details on the search strategy and a full list of specialist websites and literature reviews). When deciding whether an article included in the systematic map was also eligible for inclusion in the review, we used the criteria described in the next section. This set of eligibility criteria is a more restrictive version of that used for the systematic map. roadside*, “road side*”, (road* AND (verge* OR edge*)), roundabout*, “traffic island*”, “median strip*”, “central reservation*”, boulevard*, parkway*, (avenue* AND tree*). The terms within the ‘population’ and ‘outcomes’ categories were combined using the Boolean operator ‘OR’. The two categories were then combined using the Boolean operator ‘AND’. An asterisk (*) is a ‘wildcard’ that represents any group of characters, including no character. The search terms were identical to the original search terms except for “dispers*”, which was not included in this updated search because species dispersal was not of interest for this review (and we did not find any relevant studies on this topic in the systematic map). The search update was performed in May 2017 and covered literature published in 2015 or later. 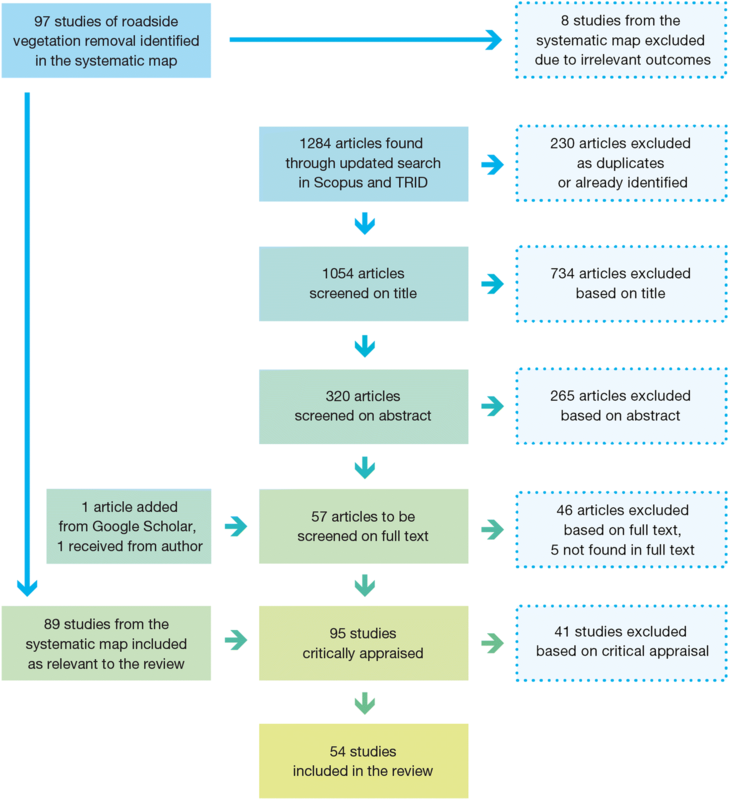 When making literature searches for the systematic map, we found that about 90% of recent studies eventually included as relevant had been identified through Scopus and/or Transport Research International Documentation (TRID). Therefore, we considered it sufficient to base the search update on these two resources, with a supplementary search in Google Scholar. When searching in Google Scholar, we examined the first 200 hits (based on relevance) for appropriate data. No language or document type restrictions were applied, but searches were conducted using English search terms only. A detailed description of our searches for literature is available in Additional file 1. Articles identified during the search update were evaluated for inclusion at three successive levels. First, they were assessed by title. Next, each article found to be potentially relevant on the basis of title was judged for inclusion on the basis of abstract. Finally, each article found to be potentially relevant on the basis of abstract was judged for inclusion based on the full text. At all stages of this screening process, the reviewer tended towards inclusion in cases of uncertainty. The screening was performed by reviewers who participated in the main screening of studies for the systematic map and who were therefore well acquainted with the relevant literature and with the study eligibility criteria. The screening of articles from the search update could be seen as a continuation of the main screening, for which detailed, multi-level consistency checking was performed. Articles identified by the primary reviewer as potentially utilisable based on the full text were also assessed by a second reviewer, and reviewers did not assess studies authored by themselves. Final decisions on whether to include doubtful cases were taken by the review team as a whole. A list of studies rejected on the basis of full-text assessment is provided in Additional file 2 together with the reasons for exclusion. Relevant subjects Roadsides anywhere in the world. We defined a roadside as the unpaved zone of a road that is exposed to roadside management. Relevant types of intervention Maintenance or restoration of roadsides based on non-chemical vegetation removal such as mowing, grazing, burning, clearance of shrubs and saplings, coppicing, pruning, or mechanical removal of invasive plants. Relevant type of comparator Non-intervention or alternative forms of the interventions. Comparisons can in principle be made both temporally and spatially. Studies with a ‘BA’ (Before/After) design compare data collected at the same site prior to and following an intervention. Other studies may be based on comparison of different parts of a roadside, some that have been subject to a certain kind of management and some that have not. These may be termed as ‘CI’ (Comparator/Intervention) studies, or ‘BACI’ (Before/After/Comparator/Intervention) if they present data collected both before and after the intervention. Relevant types of outcome Measures of functional/taxonomic diversity of vascular plants or invertebrates (including abundance of assemblages and single species). Ratings of intervention effects based on visual assessments of vegetation vitality were not considered to be relevant. Relevant type of study Primary field studies (reviews and other secondary compilations were not included). Language Full text written in English, Danish, Dutch, French, German, Norwegian, Spanish or Swedish. Studies that passed the eligibility criteria described above were subject to critical appraisal: Based on assessments of their clarity and susceptibility to bias, they were categorised as having high, low or unclear validity (with regard to our review question). No true replication (interventions not replicated). Intervention and comparator sites not well-matched (sites substantially different before intervention). Severely confounding factors present (e.g. additional treatments carried out at the intervention sites but not at the comparator sites). Methodological description insufficient (e.g. not clear to what extent the study was actually conducted at roadsides). Intervention data could not be interpreted (e.g. since they consisted of post hoc records such as ‘evidence of mowing’). If none of the above five factors applied, the study was considered to have high validity and was included in the systematic review. The validity of each study was assessed by one reviewer and double-checked by another one. Reviewers did not assess studies authored by themselves. Final decisions on how to judge doubtful cases were taken by the review team as a whole. A list of studies rejected on the basis of validity assessment is provided in Additional file 3 together with the reasons for exclusion. Outcome means and measures of variability (standard deviation) or precision (standard error) were extracted from tables, graphs and text in the included articles. When necessary, image analysis software (WebPlotDigitizer, http://arohatgi.info/WebPlotDigitizer/) was used. Extracted outcomes included measures of species richness, species diversity (e.g. diversity indices) and abundance of taxonomic or functional groups of organisms. Data on abundances of individual species were not extracted, since such data have limited relevance to our review question and since few studies had reported on the same species. Where relevant outcomes had been reported in a format that impeded inclusion in quantitative analyses, study authors were asked to supply raw or summarised digital data instead. Received raw data were compiled and summarised by ourselves (if needed). Metadata, such as data on potential effect modifiers (see below), were extracted if present in the published material; no requests were sent for unpublished data of that kind. Data were recorded using two Excel spreadsheets (see Additional file 4). In the first one, each row represented a comparison between an intervention and a control (no intervention). The second spreadsheet was used for studies where no untreated control was included; here, each row represented a comparison between two different kinds of intervention. Extracted data were examined by a second reviewer. Type, timing and intensity/frequency of roadside management. Goals of the management (e.g. conservation/restoration of biodiversity). Width, aspect and slope of roadside. Type and structure of roadside vegetation. Nutrient status of the soil. Road type (width, type of surface). Time elapsed since the road (or roadside) was constructed. Traffic (no. of vehicles per day). Road maintenance (e.g. salting, gritting, dust control, snow clearance). Mean annual temperature and precipitation. Vegetation, land use and history of land use in the surroundings of the road. Where data on altitude and climate were not available in the included articles, we retrieved them from Google Earth and WorldClim , respectively, using the coordinates of study sites. The studies included in this review reported on several different types of vegetation removal (e.g. mowing, burning and grazing) and their effects on different measures of biodiversity (species richness, species diversity and abundance) of vascular plants and invertebrates. However, the only combinations of intervention and outcome that allowed for quantitative analysis, being covered by at least three studies, were the impacts of mowing (including different mowing regimes) on five aspects of plant communities: overall species richness and species diversity of plants, and abundance (cover) of forbs, graminoids and woody plants. Data on species richness were included in our analyses only if reported as the total number of vascular plant species (we did not use data on subcategories such as invasive or native species, flowering herbs, annual species etc.). Our analyses of species diversity were limited to data on the Shannon index (H′), since this was the only species diversity index consistently reported across studies. Due to the heterogeneity of the published statistical analyses in general, and the lack of reported measures of variability in particular (such measures were only available for 37% of the studies), we conducted no meta-analysis of the extracted outcomes. None of the imputation methods described by Wiebe et al. were considered appropriate for the data analysed in this review. Specifically, an approach based on weighted mean imputation of variance would suffer from the large between-study variation, and imputation methods using p values were not considered feasible due to inconsistent reporting of such values. Therefore, we analysed the effects of mowing on biodiversity using a simplified approach based on one-sample t tests of study-level mean effect ratios. The analysis was conducted exclusively on the effects of mowing and how those effects depended on different mowing regimes. Other effect modifiers were not considered applicable in the analysis as they were not reported consistently across studies. where BD = biodiversity measure, I = intervention, C = comparator, B = before, A = after. Generally, for each analysis, we calculated the average effect ratio across all relevant comparisons reported by a study. However, where studies provided separate outcomes for different road types (e.g. highways and rural roads), we calculated separate means for each road type. Where outcomes had been reported over several years, we only used data from the final year of sampling. To the extent possible, we analysed how each of the five plant-community aspects were affected by (i) mowing in general (vs. no mowing), (ii) specific mowing regimes (vs. no mowing), and (iii) differences between mowing regimes. We characterised the mowing regimes based on three elements: (1) frequency, i.e. number of treatments per year, (2) timing of the treatment(s), and (3) hay treatment (removal or no removal). When examining specific mowing regimes, we analysed the effects of each of these three elements separately (based on comparisons where the other two elements had been kept unchanged), but we also analysed the effects of specific combinations of mowing frequency and hay treatment. Similarly, when examining differences between mowing regimes, we made separate analyses of the effects of mowing frequency, timing of mowing, and hay treatment. These analyses were made both across all available data on such changes, and on subsets with specific selections of regime elements (e.g. comparisons between mowing once and twice per year that only included cases with hay removal). Each set of study-mean effect ratios was analysed using a one-sample t test, testing the null hypothesis that effect ratios were different from one. This was done for both weighted and unweighted data. Adjusted from , weighting was based on the number of replicate treatments (n) and the sampling area within each replicate (s), following Eq. 3. In the original equation, Steward et al. multiplied the replicate term by both area sampled and plot area, but as we use data from both observational and experimental studies we applied only sampling area within replicates in our calculation. Thus, weighted analyses were restricted to studies reporting both n and s. To be able to compare results based on weighted and unweighted data, we also made unweighted analyses using the same subsets of studies as for the weighted analyses. 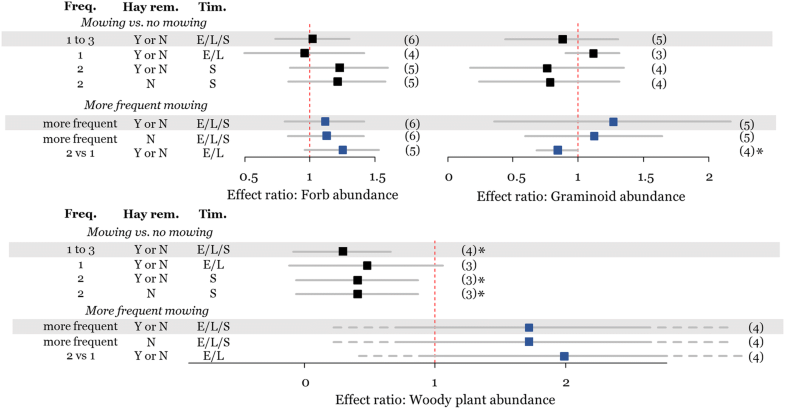 Additionally, we analysed the difference between effects on forbs and graminoids with paired t tests, using only studies that had reported abundances of both groups. We were not able to examine the possible influence of publication bias on the synthesis because of the incomplete reporting of variation, precision and statistical significance in the included studies. The findings of studies included in the review have also been summarised in a narrative synthesis. Our systematic map of impacts of various forms of roadside management included a total of 301 studies . Of them, 97 were listed as describing effects of non-chemical vegetation removal and thus potentially eligible for inclusion in this review. When reassessing these studies, we concluded that eight of them (reported in five different articles—see Additional file 2) described interventions or outcomes that were not fully consistent with our eligibility criteria. This left 89 studies from the systematic map that we considered as relevant to the review (Fig. 1). Our updated search for recently published literature on effects of roadside management returned 1228 articles from Scopus and 56 articles from TRID (Transport Research International Documentation). Of these articles, 1054 had not been available when we searched for literature for the systematic map (see Additional file 1). Title screening of the new articles left 320 that we considered as potentially relevant to the review. After screening on abstracts, 55 of these articles remained. At this stage of the screening process, we also introduced one article that had been identified in Google Scholar and one that we received from an author. Of the 57 articles thus selected, five could not be retrieved. Full-text screening of the other ones led to the exclusion of 46 articles, leaving six articles that each described one relevant study (Fig. 1). Reasons for exclusion based on full text are provided in Additional file 2—the most common reason was absence of usable information on how roadsides were managed. Critical appraisal of the 95 studies that had passed relevance screening led to the exclusion of 41 studies due to low or unclear validity (see Additional file 3 and the narrative synthesis below). Consequently, 54 studies (described in 51 articles) were included in this review. Three articles described the same experiment [26–28], and another experiment was described in two articles [29, 30], but we retained all of these five articles as separate studies since they presented partly different selections of outcomes and/or covered different time periods. However, quantitative data were extracted only from van de Haterd et al. and Parr and Way , which reported on the most recent results. The majority of articles (43) were written in English, but four were written in Dutch, two in Danish, one in Norwegian and one in Swedish. About two-thirds of the articles (32) were published in peer-reviewed scientific journals, whereas the other articles could be characterised as ‘grey literature’, consisting of reports issued or commissioned by authorities (15), conference proceedings (2), or academic theses (2). The year of publication ranged from 1970 to 2016, with a median of 2006. Slightly more than half of the studies (29) included in the review were conducted in Europe, with six in the Netherlands, five each in Finland and Sweden, four in Norway, three in the UK, two each in Denmark and France, and one each in Austria and Belgium. Nearly all of the other studies were conducted in North America (24), with 23 being performed in the US and one in Canada. One study was made in South Africa, but we found no relevant studies from Asia, Australia and South America and none from tropical regions. The vast majority of included studies (48) examined effects of mowing, whereas effects of burning were reported by seven studies (three of which investigated both mowing and burning). One study reported on effects of grazing and one on effects of shrub removal. Of the mowing studies, 38 compared mown and unmown roadsides. Effects of different mowing frequencies were examined by 28 studies, whereas 16 studies compared effects of mowing in different seasons and 14 compared effects of hay removal vs. no hay removal after mowing. Many studies included more than one of these kinds of comparison. Most of the studies in the review (41) were based on quasi-experimental interventions on existing roadsides, but 13 studies were observational in the sense that they only recorded effects of regular roadside maintenance. The ultimate goals of the interventions were not always stated explicitly, but 13 of the 41 experimental studies examined management options intended to conserve or restore roadside biodiversity in general, another nine focused on attempts to restore native vegetation, whereas seven investigated different ways of controlling specific invasive or otherwise undesirable species. Eleven studies examined the efficiency of various options for controlling weed growth and vegetation height without considering any biodiversity aspects. The majority of included studies were relatively short-term—36 of them were made over a period of 3 years or less, but 13 studies examined interventions or maintenance procedures that had lasted for 4–9 years, and five studies were made over a period of 10 years or more. The longest-term studies reported on an experiment that had run for 23 years [26, 27]. A BACI design had been applied by 12 of the studies, whereas all of the other ones (42) had a CI design. None of the included studies had a BA design. Nearly all of the studies in the review (51) examined effects of roadside management on vascular plants, whereas effects on invertebrates were reported in eight studies. Of the plant studies, 19 reported effects on species richness and/or species diversity indices. Abundance (measured as cover, frequency, density or biomass) was reported for vegetation as a whole in eight studies and for major subgroups of vascular plants in 11 studies, whereas 18 studies focused on the abundance of one or a few individual plant species. Of the invertebrate studies, five reported on the abundance and/or species richness of insect groups (such as lepidopterans), while two studies focused on the abundance of a single ant or butterfly species, and one study reported on the abundance and species richness of arthropods in general. Of the 41 studies excluded based on our critical appraisal (see above), 21 were classified as having low validity, while the other 20 were classified as having unclear validity (see Additional file 3). The most common exclusion categories were ‘intervention data difficult to interpret’ (15 studies), ‘severely confounding factors present’ (11 studies), and ‘methodological description insufficient’ (10 studies) (see “Study validity assessment” under “Methods”). An overview of included studies is provided in Additional file 5. For each study, the table gives the full reference, data on study location(s) including characteristics of roads and roadsides, details on study design, interventions and sampling, and a brief summary of biodiversity outcomes as reported by the study authors. Of the included studies, 37 analysed effects of roadside management on biodiversity using statistical tests. Among these studies, 20 investigated effects on species richness or diversity and/or abundances of functional groups of plants or invertebrates (whereas the other ones mainly reported on total vegetation cover/biomass or individual species). We found 22 datasets (data from Jantunen et al. were separated by road type into four different comparable studies) where effects of mowing on plant species richness, plant diversity and abundances of functional plant groups were reported in a way that allowed us to analyse them quantitatively. Of these datasets, 13 compared effects of mowing vs. no mowing, 13 compared different mowing frequencies, five compared different timings of mowing, and six compared effects of removal vs. no removal of hay. Data on the effects of other interventions on vascular plants and effects of mowing on invertebrates did not allow for quantitative analysis, but they are qualitatively synthesised below. Several studies investigated effects of mowing on the cover of individual species or vegetation as a whole; these are summarised in Additional file 5. Quantitative analysis of plant species richness and Shannon diversity showed that mowing effects were dependent on the interplay between mowing frequency and hay removal. Thus, there were no statistically significant overall effects of mowing vs. no mowing, frequency of mowing, timing of mowing or hay removal on plant species richness and Shannon diversity. However, species richness of plants was higher in roadsides mowed once or twice per year with hay removal compared to unmowed roadsides, and also higher in roadsides mowed twice compared to once per year (with or without removal of hay), whereas mowing more than twice per year did not increase species richness. Shannon diversity of plants was also higher in roadsides mowed twice per year. 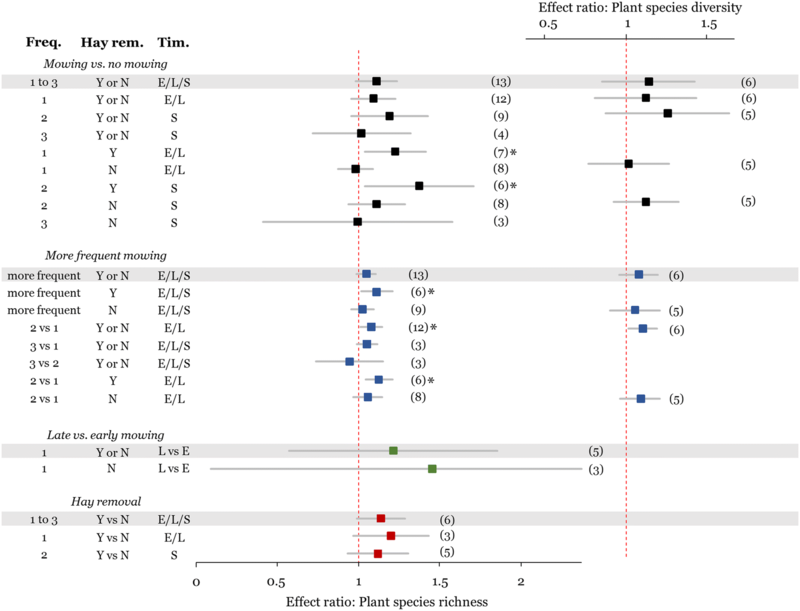 There were not enough studies to analyse the effects of hay removal on species diversity, and the variability was too large to allow conclusions on the effects of early vs. late mowing on plant species richness and Shannon diversity (Fig. 2). Similarly, mowing frequency influenced how mowing affected abundances of functional groups. Mowing twice instead of once per year had a statistically significant negative impact on graminoid abundance (cover), with a parallel positive trend towards higher abundance of forbs. Woody plant abundance was in general lower in mowed than in unmowed roadsides, although also with the clearest effect in roadsides mowed twice per year. The responses of functional group abundances to other mowing regimes showed too large variability to allow overall conclusions (Fig. 3, Additional file 6). We found very similar effects on the biodiversity outcomes using weighted and unweighted data (Additional files 6, 7); individual mean effect ratios were strongly correlated between the two approaches (r = 0.95 and 0.91 for species richness (n = 26) and Shannon diversity (n = 9), respectively). One study investigated impacts of roadside grazing, finding no effects on vascular plant species richness . Camp and Best  found that graminoid abundance was lower in burned than in unburned roadsides, and Gordon et al. found that mowing had negative effects on shrub density compared to burning. In addition, Young and Claassen  found positive effects of burning on the cover of annuals but no effect on native perennial cover, similar to the effects of mowing, and Charvat et al. found effects of burning on neither native nor exotic species cover. Few studies had investigated the same groups of invertebrates being exposed to the same roadside management regimes. Consequently, findings on management effects on these groups are difficult to generalise. Noordijk et al. found positive effects on the species richness of arthropods in general of increasing the mowing frequency from once to twice per year in medium- and high-productive roadsides, and of hay removal in medium-productive verges. According to the same study, arthropod abundance was positively affected by more frequent mowing and/or by hay removal (depending on roadside productivity). In addition, Noordijk et al. found positive effects of higher mowing frequency on the abundance of flower-visiting insects. In contrast, Helden and Leather  found that grassland Hemiptera species richness and abundance were negatively affected by more frequent mowing, whereas Halbritter et al. found no effect of the mowing frequency on butterfly abundance. Comparing roadsides mowed early and late in the year, Valtonen et al. found no differences in species richness and diversity of butterflies and diurnal moths. We found a small number of studies that could be used to address quantitatively the primary question of this systematic review. Studies on invertebrates were very scarce, and the vast majority of studies on vascular plants focused on mowing impacts. Mowing itself is a rather complex process, varying in frequency and in whether or not cuttings are removed. Indeed, our analyses showed that the effects of mowing on vascular plants were dependent on the interplay between frequency of mowing and hay removal, thus there were no statistically significant overall effects of mowing. Specifically, where cut hay was removed, mowing versus no mowing, or mowing twice a year compared to once led generally to higher plant species richness across the studies. Furthermore, mowing twice instead of once per year in general reduced graminoid abundance, which supplies a mechanism for increased species richness. In grasslands, management that reduces graminoid cover often leads to increased species richness by benefitting forb species (e.g. [42, 43]). Perusal of the studies included in the narrative synthesis supports these quantitative findings, but it also illustrates the variability in outcomes. All studies that compared mowing with no mowing found at least partly positive effects on vascular plant species richness. Under certain conditions, the effect was absent, but it was never negative. For example, Young and Claassen  found positive effects of mowing on annuals but no effect on native perennials. Mowing twice instead of once per year had different effects on vascular plant species richness and/or diversity depending on site properties [28, 37, 44]. For instance, Noordijk et al. found positive effects only in moderately productive roadsides, and van Schaik and van den Hengel  found higher species richness in roadsides mowed twice compared to once per year except on shaded sandy soils. In contrast, Chaudron et al. reported on negative effects on species richness of mowing twice per year compared to once per year early in the season. The low number of studies with comparable study designs and the rather sparsely reported study contexts, i.e. effect modifiers, made it difficult to detect clear effects of mowing regimes on biodiversity. In particular, roadside productivity and road type seem to be of major importance for how vascular plant diversity responds to mowing regimes [26–28, 31, 37]. This most likely contributed to the variability of reported outcomes, but information on roadside productivity was unfortunately absent in most of the included studies. Most studies provided information about road type/size, but because of the lack of replication across studies for certain combinations of road type and intervention/outcome, we did not include that factor in the analyses. Other potential effect modifiers, such as time elapsed between intervention and sampling, roadside age, road maintenance and surrounding land use, may have affected the outcomes too, but these modifiers were also too incompletely reported to allow us to consider them. The lack of a standard protocol across studies meant that data were gathered using different scales of measurements and different intervention combinations, further contributing to data heterogeneity. Mowing was the only management practice replicated well enough across studies to allow for a quantitative synthesis of its effects on vascular plants. We were able to compare effects of different mowing regimes, but there were insufficient data for analysing effects of e.g. grazing, burning and removal of shrubs/saplings, and for comparing effects of the latter interventions to those of mowing. Some aspects of mowing regimes were poorly represented in the reviewed studies, especially different routines for hay removal and different timing of mowing. The review was also constrained by data limitations. Measures of variability or precision were often inadequately reported, which prevented us from conducting a meta-analysis. In addition, we had to settle for analyses of taxonomic diversity and abundance of functional groups due to the lack of available data on other aspects of biodiversity, e.g. functional diversity and abundance of individual rare species. Effects of roadside management on invertebrates could not be analysed quantitatively due to the small number of comparable datasets—studies generally focused on different taxonomic groups of invertebrates. Geographically, there was a large bias towards European and North American studies (29 and 24 studies, respectively, out of 54 in total), with no studies from Asia, Australia and South America and none from tropical regions. This limits the generalisability of the review, especially as soil type seems to be of major importance, implying that management effects may differ considerably between geographical regions. Despite the fact that management effects on grassland biodiversity have been extensively studied, there is—to our knowledge—no synthesis available that summarises the effects across different contexts and management regimes. However, a few studies (e.g. [46, 47]) have analysed biodiversity responses to multiple grassland management regimes across large environmental gradients and in different contexts. The conclusions were similar to ours: a positive effect of mowing or, more generally, disturbance was found, but results were strongly modified by interactions with site conditions. There are, however, reasons to believe that effects of management in roadsides may diverge in the long run from effects on grasslands. In unfertilised grasslands, sustained mowing and hay removal can lead to depletion of nutrients (e.g. ) in nutrient-poor sites, whereas roadsides may be less affected. Nutrient-enriched run-off and/or dust from roads may counterbalance their export via hay removal. This influx of elements can be considerable (e.g. ), and it depends on factors such as pavement type and traffic load. At this time we can only speculate about the effects of these roadside-specific processes on biodiversity and the way they interact with management. However, they might, among other processes, prevent roadside vegetation from losing species that require a regular, but modest nutrient input in the long run, which is of importance for conservation in some regions [50, 51]. The input of pollutants, such as salt and heavy metals, is another run-off-related factor that may cause a divergence in management effects between roadsides and grasslands. These inputs have the potential to alter productivity and competitive interactions between species . However, we do not know yet if, when, and where they would lead to different management effects compared to grasslands. Although our first literature search gathered a large body of studies, relatively few could be used to answer quantitatively the primary question of this systematic review. Most studies focused on vascular plants and the impact of mowing regimes. Effects of mowing on plant species richness were dependent on the interplay between frequency of mowing and hay removal. Species richness was positively affected only when cut hay was removed and when mowing was done twice compared to once a year, but no negative effect of mowing was found. However, we acknowledge that specific management implications regarding biodiversity values beyond plant species diversity and dominance shifts between main functional groups cannot be drawn based on this review. Similarly, due to the scarcity of studies on invertebrates, we are unable to draw general conclusions on how this taxonomic group responds to roadside management. Differences in roadside type as well as lack of information on other effect modifiers (such as time elapsed between intervention and sampling, roadside age, road maintenance and soil type) make it somewhat difficult to inform policy or managers in more general ways on how to manage roadsides. Nevertheless, based on our review we conclude that vascular plant richness is likely to increase (i) if roadsides are mowed each year, (ii) if they are mowed twice rather than once a year (this can be expected to benefit forb diversity specifically), and (iii) if hay is removed after each cutting. We believe that the findings in this review could function as a first step in guiding policymakers and managers on how to manage roadsides most effectively for increased plant diversity in parallel with managing for traffic safety. This systematic review shows that there are large knowledge gaps on how management of roadsides affects diversity of vascular plants and invertebrates. First, relevant studies on invertebrates were very few. Secondly, studies on vascular plant diversity are almost exclusively focused on mowing; few studies test effects of other management options such as burning or grazing, or effects of roadside management in combination with influx of chemicals, nutrients or salt. The studies also suffer from short experimental duration, limited geographic distribution, and lack of common research protocols. Studying roadside management is important to understand effects on roadside biodiversity specifically, but also to understand effects of grassland management in general and how management of roadsides can enhance overall landscape biodiversity. As semi-natural grasslands currently are declining, roadsides harbouring many grasslands species could with proper management be an important part of the green infrastructure in rural landscapes . Future studies should include both animals and plants to increase the knowledge of how roadside management affects overall biodiversity and important biodiversity relationships such as the link between plants and pollinating insects. Research should also target other aspects of biodiversity, such as threatened grassland species and how the functional diversity of plant and animal communities is affected by roadside management. Our review highlights the need for studies specifically designed for measuring effects of roadside management on a wider range of biodiversity values to understand how traffic safety and biodiversity conservation goals can be combined in a win–win solution. Specifically, we stress the need for targeted studies on more organism groups, functional diversity and species of conservation concern in order to identify roadside management regimes that benefit a wider range of biodiversity aspects. All authors contributed to the design of this review and to the screening of literature from the systematic map. Additional literature was searched for by CB and screened by SJ and CB. All authors participated in the critical appraisal of studies and in drafting the narrative synthesis. SJ and CB double-checked and finalised the narrative synthesis. SJ extracted and analysed quantitative outcomes. All authors drafted parts of the manuscript. All authors read and approved the final manuscript. The authors wish to thank Kjell Asplund, Tommy Lennartsson, Mats Lindqvist, Jerry Melillo, Katherine Richardson and Henrik Smith for their valuable comments on the manuscript. Thanks to Clémence Chaudron, Rob van de Haterd, Juha Jantunen, Sacha Jellinek, Jinze Noordijk and Patrick O’Farrell for providing data from their studies (unfortunately, some data could not be used in the analyses). The review was financed by the Mistra Council for Evidence-Based Environmental Management (EviEM). 13750_2018_129_MOESM1_ESM.xlsx Additional file 1. Literature searches (search update). 13750_2018_129_MOESM2_ESM.xlsx Additional file 2. Articles excluded as irrelevant to the review. 13750_2018_129_MOESM3_ESM.xlsx Additional file 3. Studies excluded due to low or unclear validity. 13750_2018_129_MOESM4_ESM.xlsx Additional file 4. Extracted data records. 13750_2018_129_MOESM5_ESM.xlsx Additional file 5. Narrative table. 13750_2018_129_MOESM6_ESM.xlsx Additional file 6. Unweighted quantitative analysis. 13750_2018_129_MOESM7_ESM.xlsx Additional file 7. Weighted quantitative analysis. The good verge guide. Salisbury; 2016. https://www.plantlife.org.uk/application/files/4614/8232/2916/Road_verge_guide_17_6.pdf. Accessed 5 July 2018. Bullock JM, Jefferson RG, Blackstock TH, Pakeman RJ, Emmett BA, Pywell RF, Grime JP, Silvertown J. Semi-natural grasslands. In: The UK National Ecosystem Assessment Technical Report. UNEP-WCMC, Cambridge, 2011. http://uknea.unep-wcmc.org/Resources/tabid/82/Default.aspx. Accessed 19 June 2018. Jordbruksverket. Jordbruksstatistisk sammanställning 2016. Sweden: Jönköping; 2016. http://www.jordbruksverket.se/omjordbruksverket/statistik/jordbruksstatistisksammanstallning/jordbruksstatistisksammanstallning2016.4.4a82b0a7155953b608a84f0c.html. Accessed 20 May 2017. CEE. Collaboration for environmental evidence: guidelines and standards for evidence synthesis in environmental management. Version 5.0. 2018. www.environmentalevidence.org/information-for-authors. Accessed 08 Mar 2018.